As I added in my last blog post about the Health Ombudsman here, this clearly says near the end of the letter that I am NOT allowed to contact the GP surgery further. The Health Ombudsman could not take this, not the fact they wrote a letter a couple of weeks after with no notes into account, (as they have no notes to provide me) even though this had not happened at the start of when I notified them, but I did tell the Ombudsman once it had! The first part of Giggs Hill's reply was here. A few weeks ago I finally got a letter back from the Health Ombudsman in regard to my complaint to their official reply last year. (See here) It has only taken almost a year since I sent it to them on 5th February 2018! I am honestly shocked, I feel this letter is more insulting than the last one, the system is a joke and the GP surgery are probably laughing. I have attached the reply here, partly as I want others to know what a farce the system is and hopefully that others will learn from this and write their letters differently. With every single concern listed as a seperate issue, & providing proof if possible! the Health Ombudsman is a system certainly not here to support the patient. Plus, if they had listened to me on the phone when I called them about my case, they would have known I HAD contacted the GP surgery asking for the 'Significant Events Analysis Meeting'. Part of their reply was here and the rest and where I got told not to contact them anymore is here. 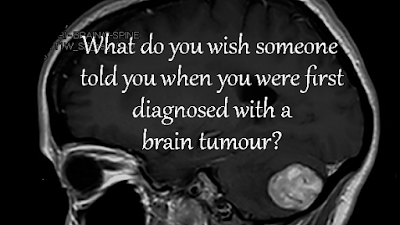 What do you wish someone told you when you were first diagnosed with a brain tumour? from the doctors at Giggs Hill - my GP surgery. Bringing me round some flowers or a card. If I knew pre op that I wouldn’t feel ‘normal’ for a very long time, would it have upset me? Yes I am pretty sure it would have. If I had been told that I would leave hospital after 48 hours, would it have reassured and calmed me massively? Yes, just the thought of staying in for 5-9 days after surgery was terrifying. But if I had been told that I would leave hospital and come home with what felt like no support, would it have scared me? That my vision would not be the same almost 3 years later, and I would still struggle to see things close up? That my abilities would change - that I would struggle to multitask or even cook dinner; forget how to spell or even think of the correct words, let alone struggle to say them and it take ages to get better? I wouldn’t have wanted to know, I couldn’t have coped. That my hair would cover the scar almost straight away, then grow back and no one could ever see it? Massive relief, like someone telling me I no longer needed a limb amputated! That I would be able to go back and listen to my husband’s bands playing rock music a few weeks after? That part of me will still be there. Gratitude. If I was told I would have a numb, lumpy and dented head forever, a dip in my neck and none of it will ever feel the same? I wish I’d been told that when I was diagnosed. The same words that have come to haunt, as well as comfort me, many a time since. …in fact that is the hardest part. Finding out your own answers from struggle and time. Not knowing if the extreme dizziness after surgery would last for a week, a month or years. Even the neurosurgeons don't know. If you knew you only had another week to cope with, you could face it easier, not feel so down and defeated and just damn exhausted. It’s the not knowing that’s hard. Not having a crystal ball. "D'you know, it's probably a completely 'backwards' way of thinking, and not really answering the question, but I was so delighted to be told I had a brain tumour, having suffered horrendously for 3 months where it was feeling more and more like my GP practice thought I was making it all up, that confirmation that I WAS seriously ill was more than I could have hoped for. It was an enormous relief!" "I am sorry that I was not told how much suffering and struggle the recovery might cause - that it would change my life and my abilities. All the info given was based on the tumour and it's removal." "I thought I'd have the op and be the person I had been 4 years before all the symptoms started. I'm worse now and can't work." "They would encourage me, instead of telling me that it may be a punishment from God. And that I need to search whom I had wronged and ask them for forgiveness!" And if you also had a brain tumour...please comment as to what you wish you had been told.